Anyone familiar with the career of Keith Haring knows he was a prolific artist with a distinct style that was simultaneously refined and primitive, deliberate yet lyrical and energetic. Clearly he aspired to create art with purity and integrity, but to do so in an accessible way so it could be shared with people. He was also widely known to pursue his art with a deeply personal vision, as a champion of social justice and a believer in the interconnectedness of humanity. The worlds Haring deftly navigated and the barriers he attempted to break down have been extensively noted by art critics. However, it’s one thing to see an artist’s work and hear critical analysis, and another altogether to hear an artist’s own thoughts, ideas, hopes, fears, questions, and most profound philosophies in his own words. Haring, as viewed through the prism of success, cannot compare to the thoughts revealed in his journals as they follow his evolution as an artist and human being, his rise to fame, and his eventual diagnosis as HIV positive. One of the many insights Haring shares in his journals is that fame changes people’s perception. In 1989, Haring wrote, “People keep asking me how success has changed me. I always say that success has changed people’s responses and behavior toward me and that has affected me, but it has not really changed me. I feel the same on the inside as I did 10 years ago.” Through Haring’s journals, one bypasses the detached academic evaluations of his work as art history and finds the artist’s own documentation and catharsis as he develops his identity and philosophy. It’s nothing short of remarkable how developed and sophisticated Keith Haring’s worldview was at a very young age. Upon arriving at the School of Visual Arts in New York in 1978 at only 20 years old, Haring begins to lay out his ideas about art and life. Haring’s populism is demonstrated early on, and eventually manifests in many forms. “The public has a right to art” and “Art is for everybody” are ideas that can be found in his journals from that time, and remained consistent throughout his career. Traveling the New York subways, Haring immediately took note of the surrounding visuals. The graffiti and advertising posters seen on and around the subways influenced Haring as not only aesthetic references but as accessible images in the public right-of-way. He engaged with the pervasive forces of advertising as repetitive and graphically engaging, and graffiti as free-spirited, fluid transgression, sometimes interacting with or commenting upon the advertising. Haring illuminated his transition from an observer of these visuals to a participant adding his own work into the negative area in ads and other spaces of opportunity in the public environment. He discusses his idea of his paintings as visual poems with hieroglyphics or pictograms open to interpretation by the viewer. His journals provide ample evidence that the visual language he developed was not simply justified by retroactive intellectualization, but evolved from a desire to fulfill a very clear vision. It isn’t surprising that Haring chose to tackle social issues in his art. 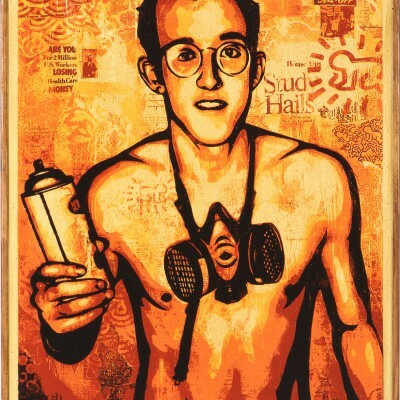 The crack epidemic, apartheid in South Africa, children’s health, and AIDS were just a few causes Haring championed. Haring discusses money and charity, saying, “Money itself is not evil, in fact it can actually be very effective for good if it is used properly. You have to be objective about money to use it fairly. It doesn’t make you any better or more useful than any other person. Even if you use your money to help people . . . that doesn’t make you better than somebody who has no money but is sympathetic and genuinely loving to fellow humans.” Haring cared about people. Keith Haring’s journals reveal a plethora of ideas, emotions, and experiences, but permeating almost all of it are his underlying populism and humanity. These qualities manifested themselves in his belief that the public has the right to art, his chosen visual language, his use of public space, his embrace of commercial projects and art products, and his devotion to messages of social justice and change. Through these journals, Haring displays intense energy, focus, and conviction, but also adventure, whimsy, and insecurity. They provide a unique window into his profound intellect, humanity, drive, and complexity that goes beyond any third-party insight into his nature – these journals are his nature.